Consistently ranked as one of the most beloved icons of British culture, Yorkshire pudding captures all the warmth and charm of old-fashioned English cooking. This recipe includes all the tips & tricks you need to create the BEST, the crispiest, most flavorful Yorkshire pudding! The very first home-cooked meal I had after moving to England was a traditional Sunday roast with Yorkshire pudding. We were still in the process of moving into our home and were invited over to dinner by a British family from church who would soon become dear friends. A dinner of sliced roast beef, crispy roasted potatoes (no one in the world makes them as good as the Brits), green peas, carrots, brown gravy and Yorkshire pudding greeted us – our first introduction to English home cooking. And it was the perfect welcome. 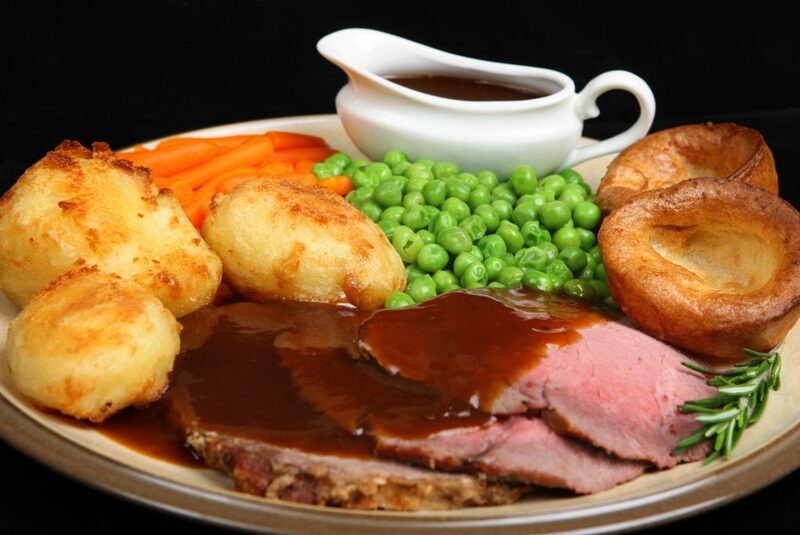 What is known as “Sunday dinner”, aka “Sunday roast”, in the UK (roast beef, roasted potatoes, veggies and Yorkshire pudding) is believed to have originated during medieval times and has remained a strong-held tradition for centuries. The British concept of the Sunday roast dinner would go on to greatly influence the food culture of the English-speaking world at large. 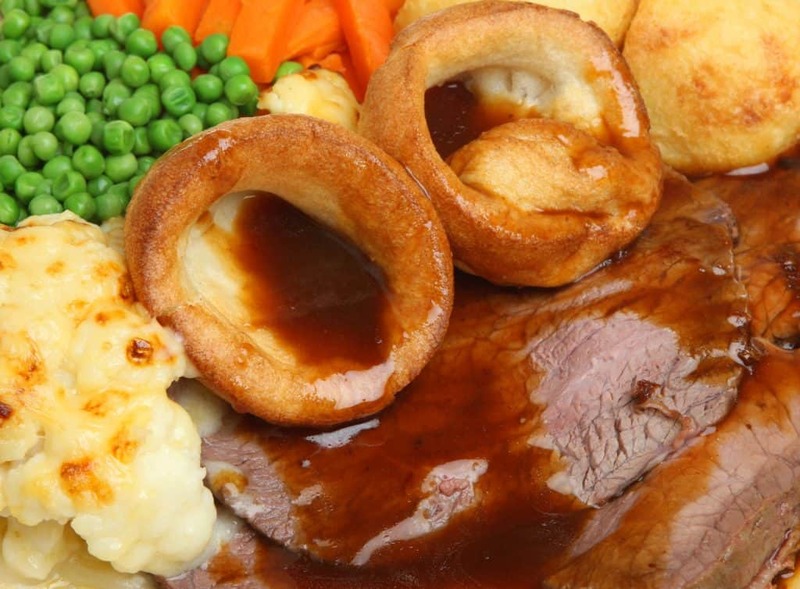 Sunday Dinner is regarded as one England’s national dishes and in a poll a couple of years ago it ranked #2 out of the 50 things people most love about Britain. You’re probably as curious as I was about the other top-ranking items, so here are a few: First place was the bacon butty; third, a cup of tea; fourth, their proud national history; fifth, BBC; sixth, Big Ben; 7th, Buckingham Palace. To beat out Big Ben and Buckingham Palace sure says something about the Brits’ love of their culinary heritage. (Now I will say I only ever had a bacon butty once or twice during the 6 years I lived there. Yorkshire puddings on the other hand…I couldn’t get enough.) Fish & Chips came in 9th and the Yorkshire Pudding, this time in its own right, came in 10th. 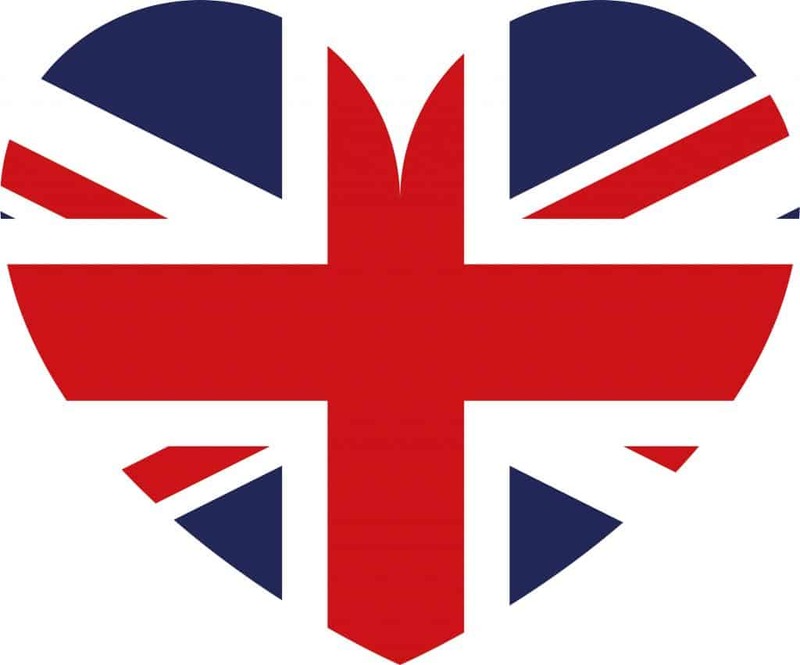 Again, that’s out of the 50 most-loved things about Great Britain. Even the Queen herself was beat out by food, coming in #15. So all this is to say that if you love Great Britain and you love good food, there’s no way around it – you HAVE to make Yorkshire Puddings to accompany your next Sunday Dinner! Its origin is ambiguous but we do have some solid clues. 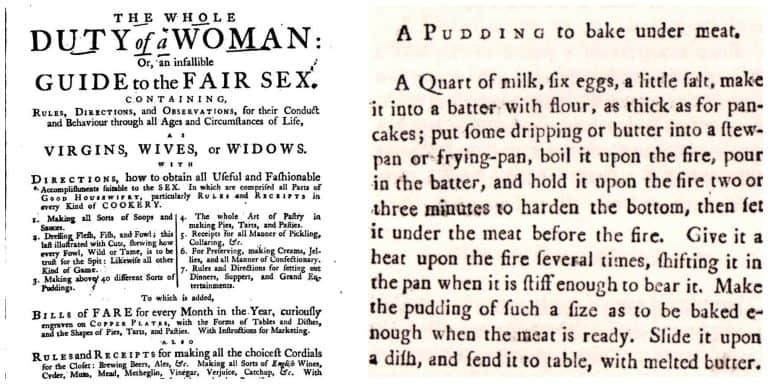 We do know the first printed reference was published in 1737 in a book called “The Whole Duty of a Woman” (*wince*) in the form of a recipe called “dripping pudding,” something that had already at that point been a well-known dish for several centuries. The clever cooks of northern England had developed a way to make use of the fat that would drip down onto the dripping pan from the joint of meat roasting on the spit above it in the fiery hearth. They found that they could place a pan of batter underneath to cook simultaneously with the roast and those fat drippings contributed both a marvelous flavor and texture to the dripping pudding. 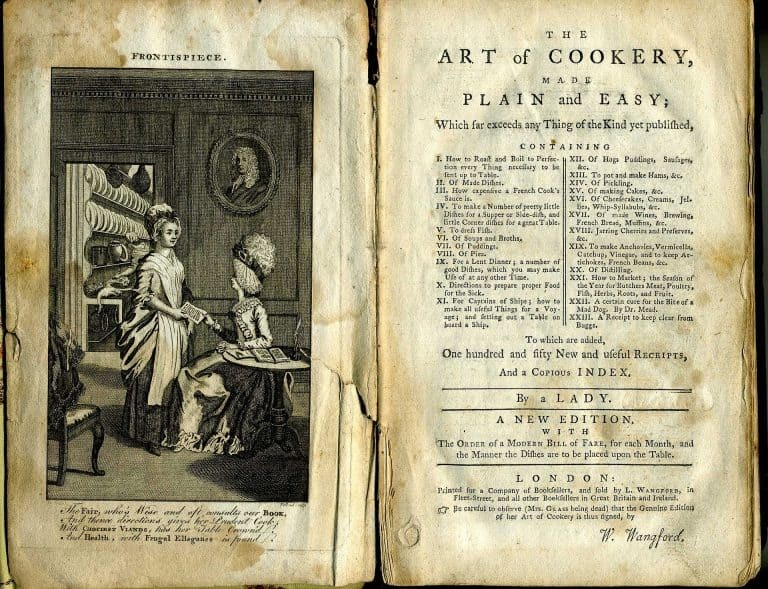 Ten years later it was published in Hannah Glasse’s highly acclaimed 1747 cookbook “The Art of Cookery,” a bestseller for a century after its first publication. This time it was named “Yorkshire pudding” and the name has stuck ever since. Traditionally Yorkshire pudding was cooked in a large, shallow baking dish and then cut into squares, but today individual puddings are most common. I prefer the individual ones because you have more surface area that is browned and crispy. While Yorkshire pudding today is served as an accompaniment to meat and vegetables, it was traditionally served as a first course with gravy. Can you guess why? The purpose was to satisfy your hunger on lower-cost ingredients so you wouldn’t eat as much of the more expensive meat during the second course. Clever and economical. While there are other foods made from batter such as popovers, gougère and Dutch baby pancakes, Yorkshire pudding are distinctive in their wonderfully crisp texture and fabulous flavor from the meat drippings. Yes, we owe a debt of gratitude to those northern England cooks and their culinary ingenuity! So what is a Yorkshire Pudding exactly? 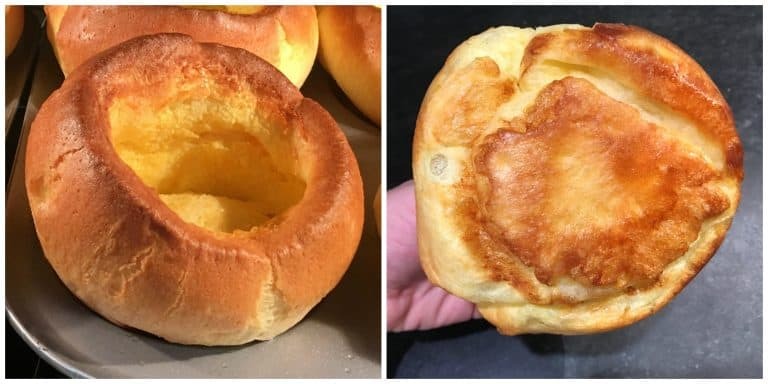 Martha Stewart described it as “a cross between a popover and a souffle.” When you use the traditional Yorkshire puddings tins, they’re flatter than popovers and have a very distinct cup shape with a hollow center that allows you to fill them with gravy and other ingredients. 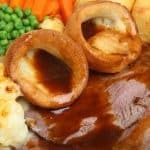 For serving the traditional Sunday Dinner, some like to place the roast beef, potatoes and veggies directly in the Yorkshire puddings and pour the gravy over it. However you choose to serve them, they’re incredibly delicious. Today we’re going to give you all the expert tips and tricks you need to make the BEST authentic Yorkshire Puddings! Some Tips & Tricks for Making the BEST Yorkshire Pudding! What’s Your Preference: Cup-Shaped or Taller? In addition to the pan you’re using, the temperature of your batter will determine the height and shape of your Yorkshire puddings. 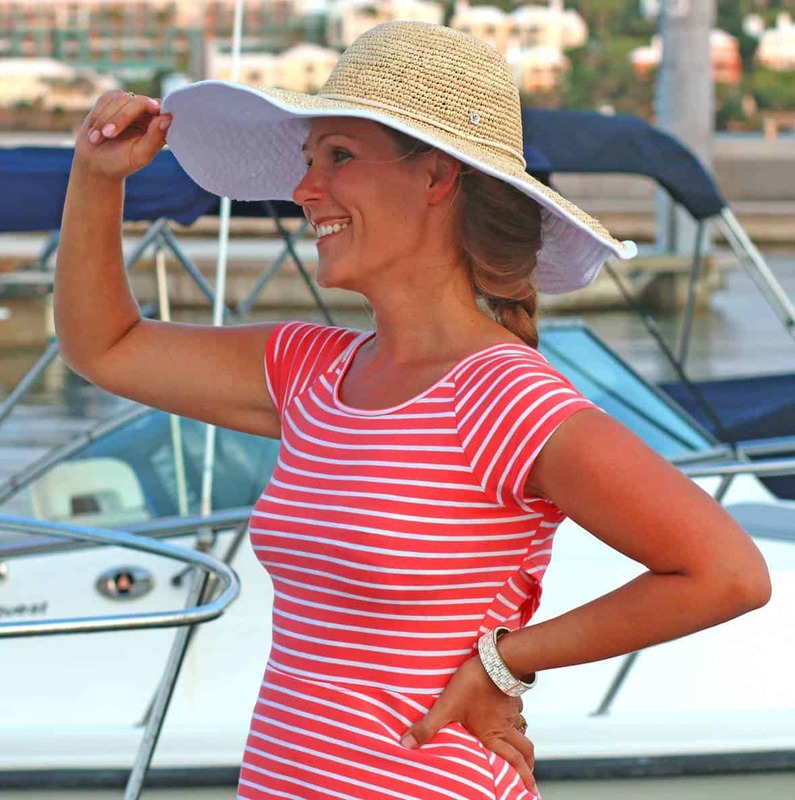 You can either go for height or your can go for shape (specifically that classic cup shape). 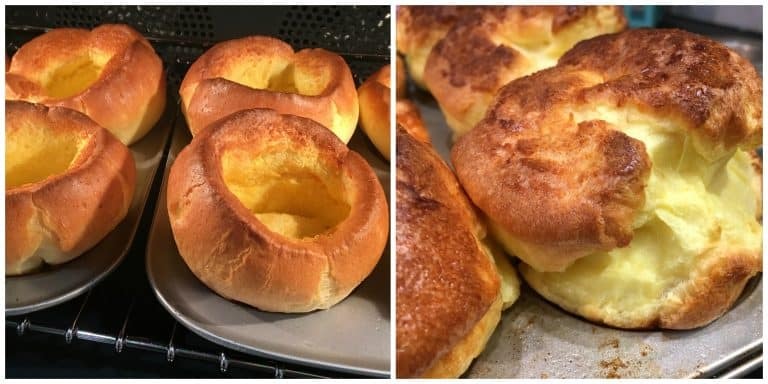 Traditional Cup-Shaped Yorkshire Puddings: You’ll need to use a traditional Yorkshire pudding tin and use cold batter that’s been chilled in the fridge. 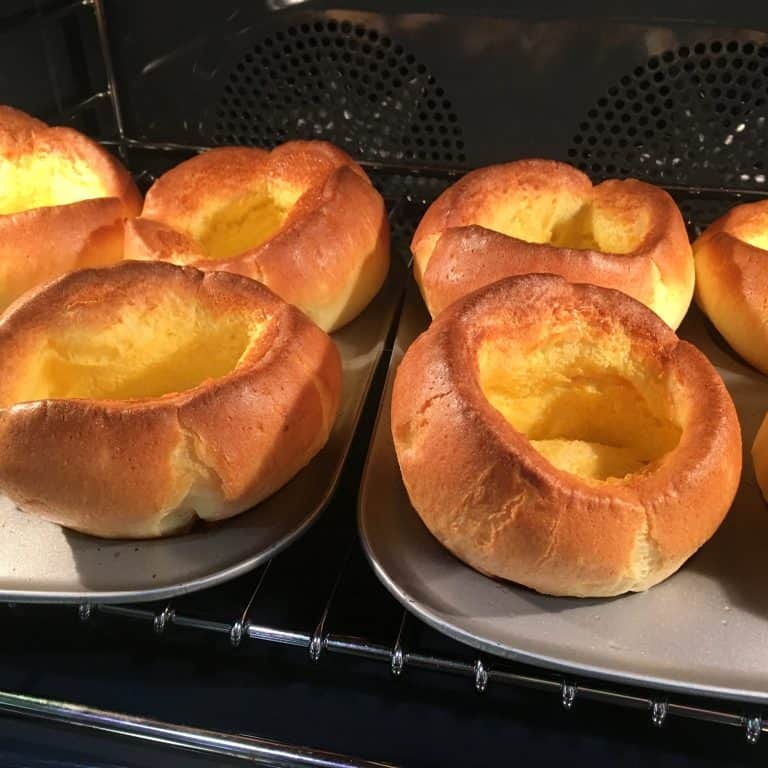 As the cold batter hits the piping hot tins the sides will rise while the center is weighed down and rises more slowly, creating that famous and distinct cup shape for which traditional Yorkshire puddings are known. Yorkshire pudding tins are also wider with a larger surface area, so you’ll more crispiness and the puddings will have a larger diameter. You can fill them up with gravy to your heart’s content or add some roast beef and veggies and pour the gravy over it. 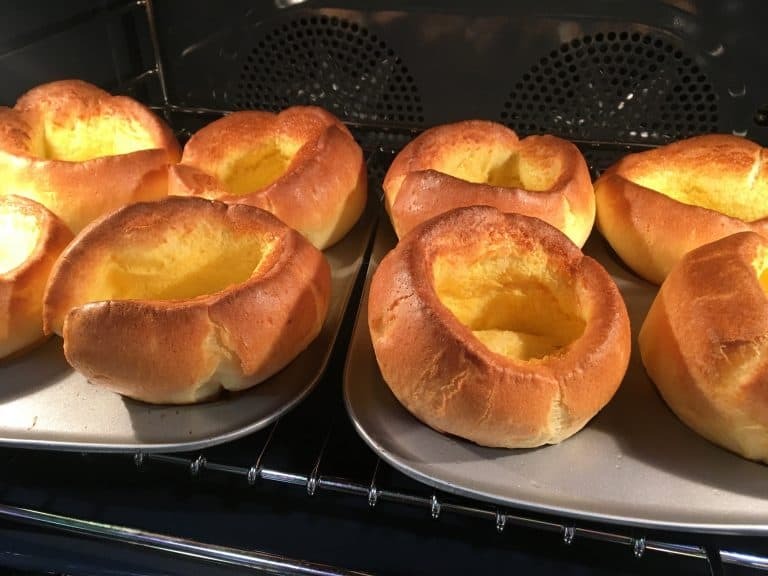 Taller Yorkshire Puddings: As more people have skipped purchasing the traditional dedicated Yorkshire pudding tin in favor of using what they already have on hand – a muffin or popover pan – taller Yorkshire puddings have surfaced all over the web. If you want to go this route, use room temperature batter. As the room temp batter is poured into the piping hot tins, the puddings will rise faster and taller. If you want them even taller you can add an extra egg white to the batter. You can experiment with both methods and decide which one you prefer. Below left: Using a Yorkshire pudding tin. Below right: Using a muffin tin. Popover and muffin tins will work but what you’ll get is, well, popovers. If popovers is what you want, fine. But if you want Yorkshire Puddings, we highly recommend using the traditional Yorkshire pudding tin. Non-rested batter will result in Yorkshire puddings that are flat, both in shape and in flavor. Letting the batter rest, either at room temp or in the fridge (see above, “Cup-Shaped or Taller?”), will allow the liquid to penetrate the starch molecules in the flour, causing them to swell and creating a thicker consistency with a more uniform structure. This will enable a better rise for your Yorkshire puddings. Let the batter rest of at least an hour but preferably longer and up to overnight. Resting the batter for a generous length of time is vital for the best flavor because it will create a more complex flavor (think of bread – the longer the bread dough rests the better the flavor of the bread). 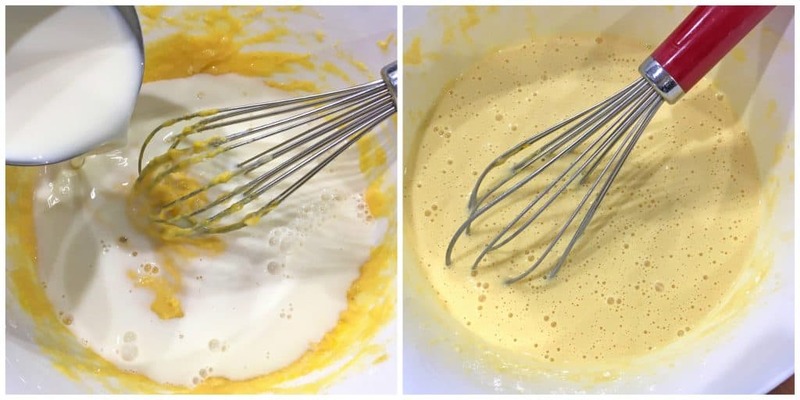 Either keep the batter in the fridge the entire time until ready to use (if using cold batter, see above), or chill it in the fridge and then remove it and let it sit a couple of hours to come to room temp. Then give it a few whisks to aerate the batter. Get ‘Em Hot – Piping Hot! For the crispiest Yorkshire puddings you must preheat the tins with the fat in them until they’re piping hot. They should be so hot that when you pour the batter in them you’ll hear it sizzle. You’ll get a better rise and, most importantly, a crispier texture. Don’t Pass on the Fat! Traditionally called “dripping pudding” because it was baked under the roast hanging above it, dripping fat down onto the pan of batter, Yorkshire puddings aren’t Yorkshire puddings without beef fat (called “beef dripping” in the UK). Beef fat not only contributes the best flavor, it makes all the difference in the texture of the puddings. There’s a reason French fries used to be deep fried in beef tallow – it unequivocally produces the crispiest, most flavorful results. The higher in saturated fat the oil is, the crispier the results will be, and longer they’ll remain crispy. Using vegetable oils or butter will result in limper Yorkshire puddings. Do it right, use beef tallow. 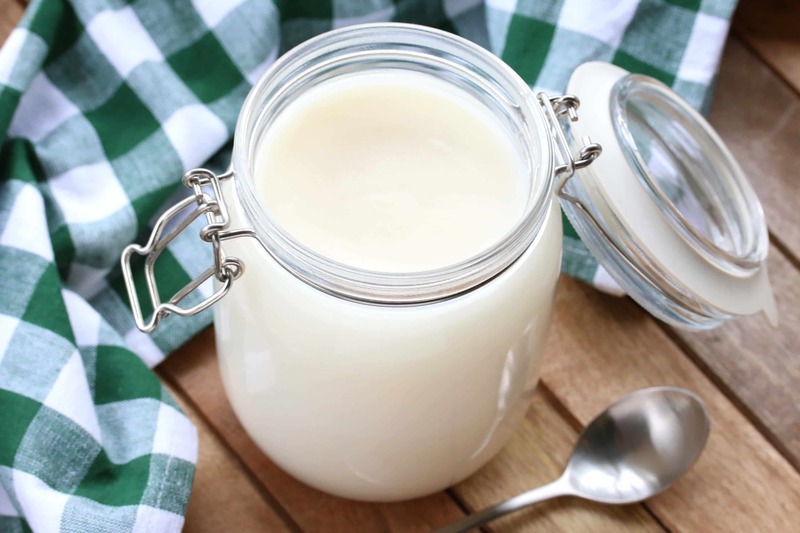 To make beef tallow yourself – and MUCH cheaper – follow the same procedure outlined in this tutorial for rendering your own lard. Yorkshire pudding must be served immediately. These puddings are very delicate and will lose their crispiness quickly. So time your dinner to have everything else ready with your guests seated at the table a few minutes before your puddings are done. Then take puddings out of the oven and immediately put them on the plates. Ladies and gentlemen, dinner is served and your perfect Yorkshire puddings await! 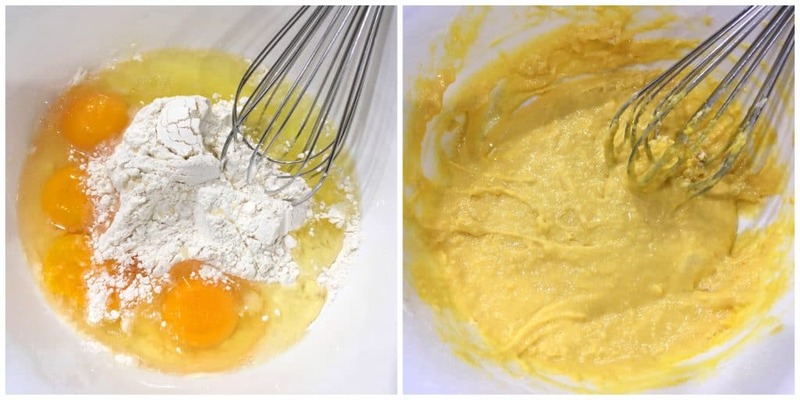 In a mixing bowl, whisk or beat together the flour and eggs until relatively smooth. Using a traditional Yorkshire pudding tin (*see blog post for discussion about which type of tin to use), place a teaspoon or two of beef tallow in each tin and place the tin in the oven for about 6-7 minutes until piping hot. Bake the Yorkshire puddings for 11-13 minutes or until a deep golden brown. Perfectly crispy and flavorful Yorkshire Pudding! Pour the batter into each tin (the pan should be hot enough that the batter sizzles) between 1/2 to 3/4 full. (Note: If making two large Yorkshire puddings in two 8-inch cast iron pans, fill each pan slightly less than half full. These will need to bake slightly longer than individual puddings.) Bake the Yorkshire puddings for 11-13 minutes or until a deep golden brown. Makes enough for 12 Yorkshire pudding tins or regular muffin tin or two 8-inch cast irons if making two large Yorkshire puddings. Serve immediately. Traditionally served with a roast, roasted potatoes, veggies and brown gravy. To Freeze: Let the Yorkshire puddings cool completely then freeze them in ziplock bags or an airtight container for up to one month. Let thaw and then toast in the oven. I’ve never tried this before…it looks delicious! Yum! Agreed, looks delicious but If you haven’t tried it, then please don’t rate it. Thank you…a recipe should not be rated unless you’ve actually tried it . But keep up these fantastic recipes ! I notice that you use the term ‘tallow’ which grates on my ear but only because, here, tallow is what candles are made of. Technically, you are correct but we always call it Dripping, Beef Dripping. That has just woken a memory – toasted bread (made with a toasting fork at the coal fire in the living room) spread with the thin layer of fat at the top of the dripping and the unctuous beef jelly underneath – a mouthfull of umami! I feel quite peckish now but it is bedtime, thank you for this post, it has taken me back some years. A Brit relying on Betty Crocker to make an English recipe…you know, Toffeeapple, in centuries past that offense would have warranted public shaming! ;) I’ve included the term “beef dripping” in your honor. I shan’t have any more grating ears :) Yes, I’ve spoken to several Brits who recall “dripping toast” as a favorite pastime. It was also included in an article I read about fabulous traditional dishes that have been all but forgotten. Lardy cakes was another – a personal favorite that I’ll be posting to my blog in the future. Well yes, but I am Welsh. It used to be that YP was served only with Beef but now, it seems, it is served with any roasted meat. I was at my daughter’s house on Christmas day where it was served with turkey. I could not, quite, cope with that even if iI did make an effort. Lardy cakes – not something I have ever eaten very much, I look forward to your post about them. Ha! Well there’s certainly something to be said for culinary traditions, many of them anyway. Wouldn’t it be marvelous to be able to recreate the truly traditional way of making Yorkshire pudding? A pasture-raised joint of beef impaled on a spit above the fire in a kitchen hearth; the beef fat crackling and the juices sizzling as they drip down onto the pan of batter below….That kind of vintage home cooking just can’t be replicated today. Someone needs to open a restaurant that does just that – with the stone hearth placed at the center of the room where everyone seated around it can watch and smell the magic happening! Traditionally, yes, only with beef, but when I was growing up my Mum served them with every kind of roast meat. Mint sauce is only supposed to be served with lamb, but I enjoy it with all types of roast meals! Hi, They used a dog called a Turnspit in the kitchen exactly for this purpose! This breed is now extinct. No kidding, Karen?? I looked it up and you’re right – incredible! These are incredible!It took a few tries to get them to look almost as pretty as yours but the flavor never disappointed us. A huge hit with my family! I can see why they love it so much over there! Looks like such a hearty and filling addition to dinner. That picture of the whole meal makes me really want to make the whole thing! It looks amazingly delicious! Lots of great memories in the comments. Grew up with Yorkshire pudding. My Dad was a great cook for a few things, and the best was “roast beast” -beef– and Yorkshire pudding. We had it for Sunday dinner about once a month. HIs recipe was one one and two: I cup flour, 1 large egg and 2 cups of milk. He would save bacon drippings. A thimble full in the bottom of each of 12 cups of a standard size muffin tin. Put the maintain into a hot 400 degree oven for about 8 minutes. Take it out, pour equal amounts of batter in each cup. It should sizzle to indicate the fat is hot enough (he would sprinkle a couple of drops on the fat to make sure it sizzled before adding the batter. Bake in a closed oven for 30 minutes–no peeking!. He did this after taking out the roast beast–it needed to rest for 30 minutes, just the time it takes the Yorkshire to cook. And to make the gravy. Light, airy, toothsome and just the right hollow for dish gravy and pan gravy. Served with roast beast and roasted potatoes and gravy. (dish gravy are the juices from the meat that are released while the beast is resting. So good! I have since made them using this recipe and cooking beef tallow. Really good. We always got a hollow like the picture on the left, even though he used a regular muffin pan. I have been making Yorkshire Pudding since I was 9, 53 years. They are absolutely one of my favourite foods. These look absolutely amazing. I can’t wait to give them a try ! Looks so delish! I can make them at home now, definitely a great addition on dinner! Yorkshire pudding with gravy has to be one of the most comforting foods ever! Thanks for sharing this tasty recipe. That is so fabulous!! Can’t wait to give it a try! This looks amazing! What an absolute comfort dish! This was amazing! My kids really loved it! 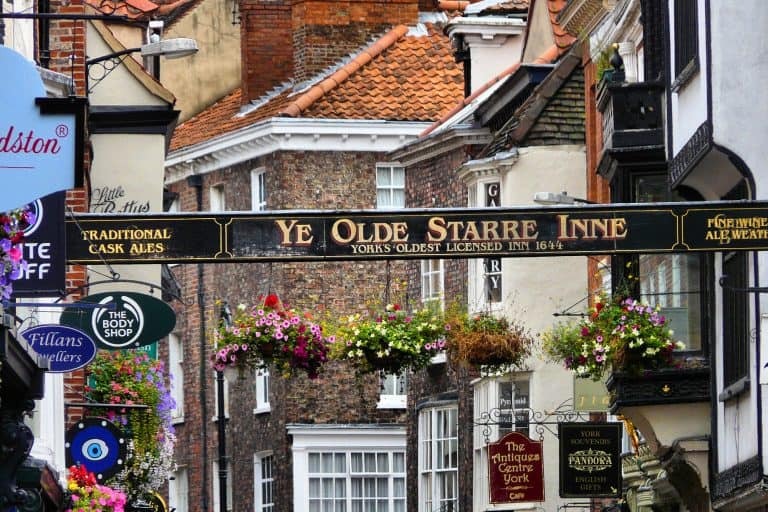 I’ve never had York Shire Pudding… so much information! This reminds me of our trip to London…can’t wait to try make it!! I love the background that comes with this recipe! Makes me want to take a visit to England – I will have to try this recipe in the meantime. What a wonderful recipe! Thanks for sharing. Thank you for all this interesting information and tips! I love Yorkshire Pudding! Nothing beats a good old fashioned recipe! I love how simple it is to pull together. Thank you so much for all the easy tips for making Yorkshire pudding! It looks fantastic!!! 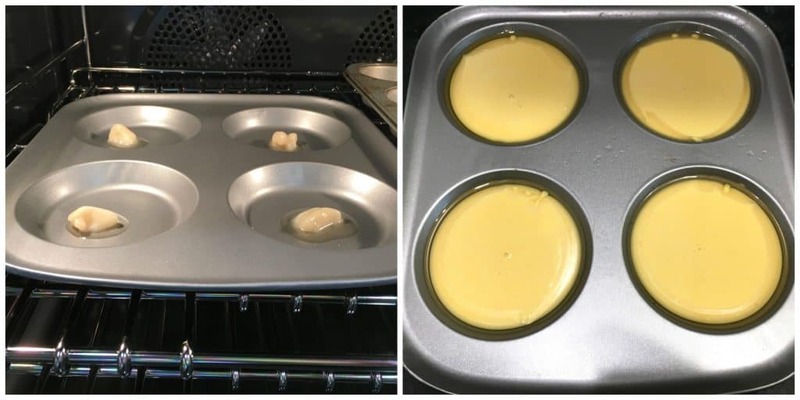 Kimberly, I’ve been making Yorkshire pudding for several years but have always used a muffin pan, have never used tallow and generally use the batter right away, maybe let it sit for about 15 minutes.. I bought the Yorkshire pudding pan and tallow per your recommendation and followed all of your tips. I’ve thrown my recipe out and am sticking with yours for good! They turned out EXCELLENT! Absolute perfection. More surface area of crispiness, far more crispy and flavorful, the perfect shape. Thank you so much for this wonderful and thorough tutorial and recipe! I’m so thrilled to hear that, Natalie, thank you! Great write up, as usual, Kimberley! These were a staple when I was growing up in England. My grandmother was from Sheffield in Yorkshire and Sunday roast dinners cooked by her or my Mum always came with Yorkshire puddings. Whenever my Mum made them for foreign guests they were always very popular. Now living in Thailand with a Thai wife, my Mum taught my wife how to make them when visiting on one occasion. Thais are not always impressed with Western food, but again, everyone seems to love Yorkshire puddings. My wife was using four eggs, but when she made some last Sunday she used five eggs. To be truthful, I couldn’t taste much difference. Four is fine. The other thing to add is that you shouldn’t be tempted to open the oven when they are cooking. If you do this or the oven isn’t hot enough they won’t rise. We find that we normally have to cook them for around 25 minutes, but there are many factors. My grandfather’s sister moved from the UK to Colorado Springs after WW2. Of course, she tried to make Yorkshire puddings but there were problems because of the high altitude. As you mentioned, Yorkshire puddings were designed to fill stomachs cheaply. When my Mum was young just after WW2 she said she sometimes ate these with jam as a cheap meal. Another popular English dish is toad-in-the-hole, which is roast sausages surrounded by Yorkshire pudding batter. Hi Phil, it’s so nice to hear from you! Thanks for sharing those insights about Yorkshire Puddings. Funny you mention your mum eating these with jam, I really enjoy that as well. In fact, I’ve served these numerous ways as a dessert including filled with lemon curd and/or strawberries and topped with whipped cream or filled with caramelized bananas with caramel sauce drizzled over them. They’re wonderful enjoyed as both savory and sweet. Yes, toad-in-the-hole is another favorite: https://www.daringgourmet.com/toad-in-the-hole-british-sausage-and-yorkshire-pudding-bake/ And in the past couple of years I’ve been making my own homemade bangers (I’m posting that recipe soon). Thanks again for visiting and I hope you and your family are doing well. P.S. Where did your blog go?? Hi Kimberly, good to hear from you too. Unlike your popular blog, mine died a bit of a death. It got to the point where the effort involved in continuing just wasn’t worth it. Also, with two kids I was running out of time. I honestly don’t know how you find the time to look after your two children and create the content that you do. If you’re interested in learning to read Thai (probably not!) I’ve started a YouTube channel and currently this is where I’m directing my efforts. Apart from a few foreigners making authentic European sausages in Thailand, the local sausages are very bland. People probably wouldn’t believe how many different types of sausage are available in the UK, especially if you can find an old-fashioned butcher shop. I therefore look forward to your sausage recipe! Hi Phil, I totally understand. I set limits for sure, generally publishing one new post per week, and I just squeeze the work in here and there, mostly in the evenings after the kids are in bed. I couldn’t locate your YouTube channel from your website, what is the url? It’s new and there is still a lot of work to do! Once it has a bit more content I will add some links from my site. That’s fantastic, Phil, thanks for sharing! Your videos are really well done. You a have a very pleasant, calming and laid back manner that makes your tutorials approachable and enjoyable. With the large number of expats in Thailand there’s no doubt a great need for the service you’re providing. Well done and I wish you the best of success in your new endeavor! Perfect Yorkshire puds! I usually adapt recipes but made followed the directions exactly as written. Even ordered the pudding tins recommended. Turned out better than ever before. Sticking to this recipe. Thanks so much, Tim, I’m thrilled they were a success!